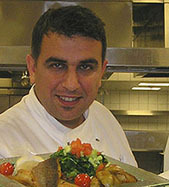 After worldwide culinary stints in London, Dusseldorf, Munich, Tunis and Belek, Chef Eyüp joined the Kempinski Hotel Barbaros Bay in Bodrum, Turkey in March 2006. During my stay at the hotel in March 2006, I had the opportunity to interview this native Turkish chef who loves cooking with fish, especially sea bass and dorado, and also with octopus and other types of seafood. He likes to create the best food of the Sultan's Table, Ottoman cuisine, utilizing all kinds of spices. What doesn't he like? Okra. For Chef Eyüp, "the concept of the food should match the environment, that for the people who visit here, the food should match their tastes." He also believes that it is important for a chef to train young chefs, and in training them he also motivates himself; "If you share, it becomes bigger." He is excited about his new home at the Kempinski Hotel Barbaros Bay, and in improving himself there. Not only does this generous chef cook at the restaurant, but he also enjoys cooking for his family when he is at home. When I asked him how he spends his time relaxing, he replied, "Play with my children (he has two sons, ages 2 and 6 years), because when you have children, you do not have time to relax." Preparation: Marinate the sea bass filet with ½ of a lemon, and season with salt and pepper. Grill the sea bass. Add the remaining freshly squeezed lemon juice and the olive oil to a pan and simmer on low heat. In another pan, add the butter, onion and garlic and sauté. Add the lentils and a little water and heat over low heat for approximately 5 minutes. Remove from the stove and finish by adding the chopped basil. Presentation: Put the green lentils on a plate, top with the grilled fish, drizzle the lemon sauce over the fish, arrange the rocket leaves on the fish, and scatter the cherry tomatoes around the fish. Preparation: Drain the soaked white beans, rinse in cool water, drain, and then add the beans to a large pot, add fresh water and bring them to a boil. Drain and rinse again in cool water and drain. Meanwhile, in another pot, add the butter and sauté the onion, garlic, green pepper and pastrami; add the tomato paste and a little water and bring to a boil. Remove from heat, add the beans and then place the bean mixture in an earthenware pot, (or casserole dish), and cook in a low oven for approximately 1 and ½ hours. Presentation: Serve with a side dish of rice. Please read our articles on the Kempinski Hotel Barbaros Bay and Turkey in the Destinations, Hotels and Resorts, Chefs' Recipes, Restaurants, Spas and Luxury Products sections.